Joy and good cheer? Or sadness and fear? But wait! While some of us achieve the Christmas of our dreams for others the reality is often very different. There are the people who may have recently lost a loved one, those who are going through a painful breakup, the people who live alone and have no family to be with, the thousands of people who are required to work over the festive period, the homeless, and those who are desperately trying to find space in a refuge to escape domestic abuse. Then there are the practicalities, we may find ourselves working overtime to cover the extra financial burden while actually needing more free time to do the Christmas shopping! The worry when we are handed the Christmas list and do some quick mental arithmetic and realise the enormity of the total cost. All of this can leave us feeling stressed and anxious and wishing it would all go away, unable to enjoy what we have worked so hard for. Christmas can feel very lonely and isolating, even in the midst of our family if we are unable to share our concerns with them. Expectations are high and we can't bear to disappoint. The holiday period can also see a dramatic rise in incidents of domestic abuse, more time than usual in each others company can lead to added tensions compounded by noisy exctied children and messy wrapping paper strewn rooms. Increased levels of alcohol consumption can ignite a potentially explosive atmosphere resulting in violent assault and the many repercussions that follow. The simple added pressure of having to invite extra people for Christmas lunch can leave us feeling overwhelmed and resentful when all we really want to do is stay in our pyjamas all day, eat seasonal goodies and watch TV. So what can we do to avoid some of these issues? Talking things through and sharing some of the burden can feel like a huge relief. Or taking some time out, going outdoors for a while and being still and quiet can refresh and energise you enough to ensure you can enjoy the festivities. If you are alone, your local authority or library may have details of lunches or activities that you may enjoy accessing, the company of others can be uplifting and new friendships could be forged with likeminded people. But if that feels too overwhelming or difficult then the Samaritans are just a phone call away, day or night, and will listen to your concerns. Domestic Abuse needs specialised help, if you are in an abusive relationship and wish to leave or just need some extra support, then your local police authority domestic violence unit can help you access many organisations that offer practical assistance. Counselling can also be helpful at this time, it allows us to step back and be ourselves, to be open and honest about how we are truly feeling, and can give us new perspective on the things that are troubling us. Sending you peace and goodwill. 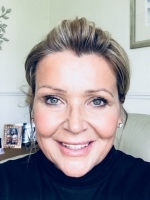 Ruth Benstead MBACP is a Counsellor and Therapist living in the Peak District of Derbyshire. Working in private practice in person with individuals couples and young people. And also via telephone and Skype.